Given how often automakers expect electric-car drivers to charge at home—80 to 90 percent of the time, by most estimates—it’s surprising that more attention isn’t paid to making sure that those drivers can get the most out of home charging. With its e-tron electric SUV arriving in dealerships this spring, Audi is one of the first automakers to partner with a retailer consumers probably already trust to keep it all organized and on a tight timeline: Amazon. 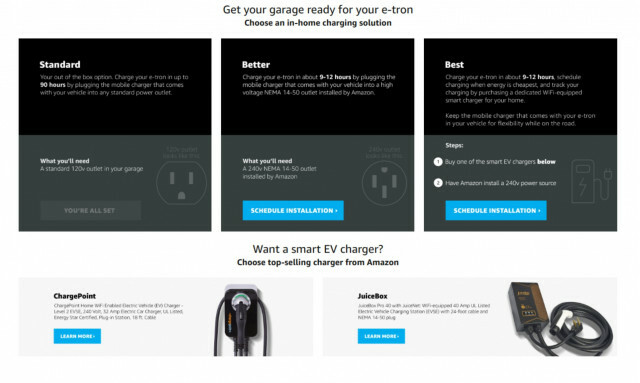 At an Amazon and Audi Charging Solutions page, drivers and shoppers can see three levels of home charging for the e-tron: Standard, Better, and Best. DON’T MISS: How to recharge an electric car in the middle of nowhere: Amazon drone? 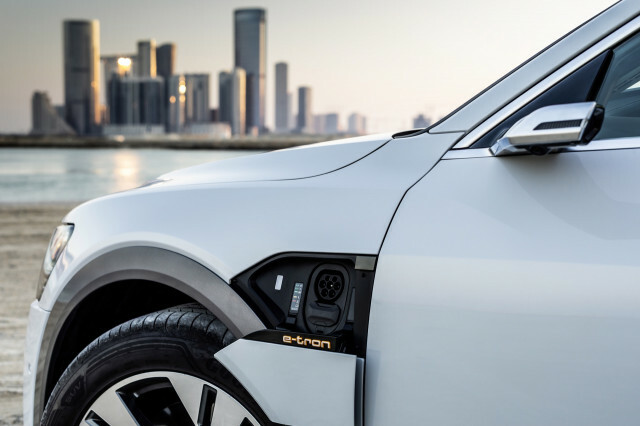 Standard means using the mobile charger that comes with the e-tron to plug into a standard U.S. 120-volt outlet—with a full charge taking up to a whopping 90 hours. (In this case, there’s nothing to buy.) The Better solution involves plugging the e-tron’s 240-volt mobile charger into a NEMA 14-50 outlet that’s been installed through Amazon. And the Best solution involves using a dedicated wi-fi equipped smart charger, while keeping the mobile charger in the vehicle so it’s there when needed. Both the Better and Best solutions, utilizing a 240-volt outlet, allow a full charge in 9 to 12 hours. Through the Audi program there are two chargers: a 32-amp ChargePoint Home, or a JuiceBox Pro offered in 40-amp or 32-amp versions. Both offer voice control via Amazon Alexa and are UL-listed and Energy Star Certified. Amazon, which has been selling Level 2 home chargers for many years—we first reported on it in 2011—bases pricing on a series of simple questions such as whether the charger will be installed in a basement or garage, whether the panel has been upgraded or not, and whether the building was built before or after 1990. It also asks for the estimated length of conduit needed between the electrical panel and the preferred location. A full service-panel upgrade is one of the top options if you find you’ll need to juggle between your central A/C, car charger, and dryer. The Amazon service includes the installation of the charger and of a dual-pole 50-amp circuit breaker (40-amp if required/desired, for the 32-amp unit), as well as the installation of a junction box if required by local code. It doesn’t include projects that involve trenching, drywall work, or other rewiring, and permitting and inspection costs aren’t included. The charging program, installation and all, is being phased in now for some cities—with many more soon, before the vehicle’s April launch. It’s backed by what Amazon calls its Happiness Guarantee, meaning essentially that Amazon with be the go-between to help resolve anything between you and the professional—an aspect that could be quite useful in big-city markets (on the West Coast especially) that are short on electricians, among other skilled trades. Another big bonus of the Amazon program: Under its terms, the service provider must call you within one business day of placing the order to schedule the installation. Amazon works primarily with third parties, which means a background check and approval process.